School Dinners are priced at £2.30 per day which is £11.50 each week. The total cost for the second half of the Spring Term is £69.00. If you would like your child to start having or stop having school dinners it really helps if they change at the end of a term. 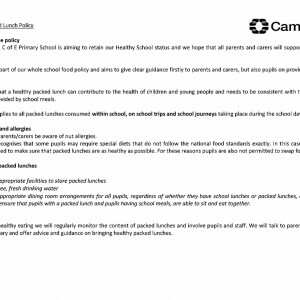 It is necessary to put this in writing to the school office stating your child’s name and class and the date from which you would like them to start or stop having school dinners. You can also pay termly or half termly. If you want to pay for school dinners online you can do so via the link below entering your unique code which was sent out to all pupils paying for school meals. If you do not have the letter containing your unique pupil code please ask Pam for a copy.